I'm sorry it's taken me so long to post pictures, but finally here they are! Max was very excited to receive his backpack. It was from Lindsey over at Life in Purple. Max wanted to put the backpack on right away, and even wore it out and about when we ran errands. 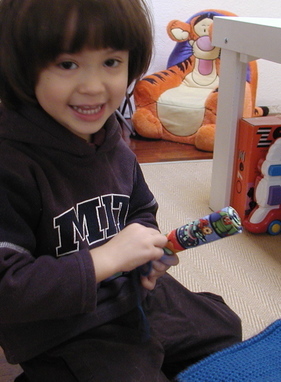 Instead of becoming scissor fodder, the robot fabric became a train driving surface, and then a train carrying device. The pompoms on the outside of the backpack suffered a little mauling by the cats but are mostly still intact. We've glued things and cut things and worn the backpack, so I'd say that this kit was a big hit! Here's a picture of a friend's baby, Grace, 4 months old. She's wearing one of the hats I made this weekend using Amanda's wonderful hat pattern. I modified it a little to change the purls into knits because I don't like purling. 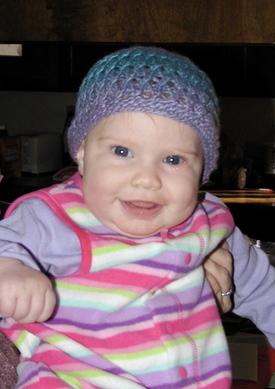 This is my second hat for Grace, both were too small. (This one is closer to the right size than my last one.) I keep underestimating the size of her head. And it's not like she has a whopper head or anything. I think she's normal-sized, I just keep thinking small. The yarn for this one is Karaoke, 50% soy silk/50% wool. It's very nice, but kinks a bit. Especially if you frog your knitting a lot (which I do). I also made one in a fluffy acrylic blend, but it didn't photograph well. And I started a hat for Max. Yay! I got my backtack goodies today!!! They're really amazing, but unfortunately I don't have my camera with me so I can't post pictures. You can go over to Lindsey's blog, she's posted great pictures of the whole kit. 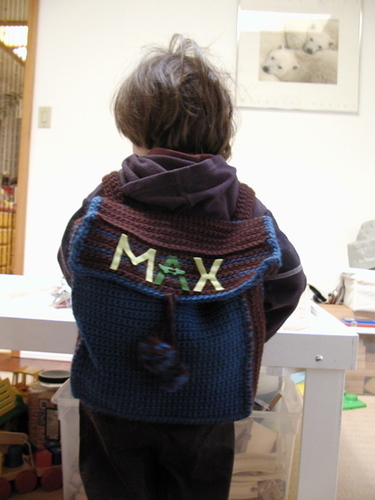 She sent a crocheted backpack for Max (look at the adorable alligator button/"A" cross bar! 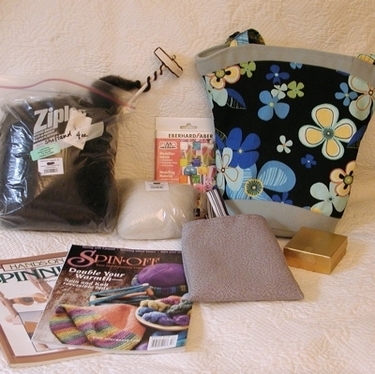 ), filled with crafting goodies, candy, plus a really cool book that I haven't seen before, Color on Color. Given my "issues" with color, this is a great book to flip through and get colorful inspirations from. In her card, she said: "Dear Max, All of this is for you!" How sweet! I'm hoping to get Max to share with mommy. 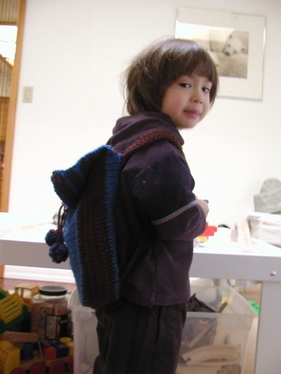 I did try to fit the backpack on me, hoping I could "borrow" it, but alas it's too small. This weekend I got my order from Cia's Palette. I found out about some of these new fabrics in one of Amy's posts over at the angry chicken. I fell in love with the little goldfish when I saw them there, and had her post bookmarked for a month until I could order these. From top, these are Kokeshi Kitties, Goldfish, Goldfish in bags, and Sumiko fish. The two goldfish ones are from the Heather Ross series, "Lightning Bugs and Other Mysteries." You can see the other prints in this line here. Or by clicking on "Click here" under "What's New" on the Cia's Palette homepage. But they're not listed with the other fabrics in the navigation bar on the left. Originally I had thought I would make a vest for Max from the Sumiko fish, but after receiving it I think that the print is too big for such a small boy. I might use the goldfish instead. As for the others, I don't have plans for them yet. Kim at dioramarama received my backtack II package this weekend, so I can post the full pictures here. I'm so glad that she said she like it! Yay! They're also up at the backtack site---so many beautiful things there! Muchas gracias to Nicole & Alison for organizing! Here's a view of the whole kit. Kim said she was interested in learning to spin, and in making fimo clay creations. It was too difficult to decide which to indulge, so I just went for both. I went to the local yarn store and got some spinning supplies: a top-whorl drop spindle (which can be spun against a thigh, Navajo-spindle style), some beginners roving that's supposed to be easier to spin, and a book that was recommended by the woman at the store. Then I headed over to Michael's for some Fimo. Isn't it pretty? I love the curved top. I just had to modify my plan and make something like this instead. I'll be getting the book soon, but in the meantime I approximated a pattern for it. 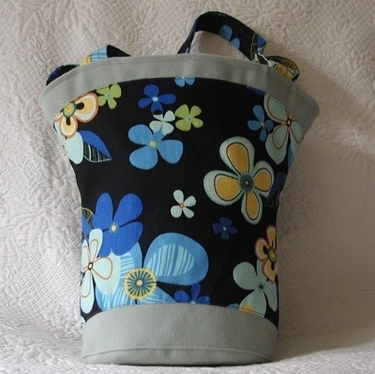 My original plan was to do the bag entirely in the black flowered print, using the green for piping along the bottom and top seams, and for handles. So I bought just a little of the green, much more of the black. With the revised plan, I ended up needing much more of the green than the black. Luckily I was able to fit most of it in. I always buy way too much fabric--just in case--and this time it turned out to be helpful! I had to do the inside oval in black instead of green, but I think that's ok. I had also cut green handles, but the material was so stiff it was impossible to turn right side out. Of course I had already trimmed the seams, so I didn't have the option of opening it up and sewing a narrower seam. I just went with black handles, I think they work. I'm going to have to make another one for myself, I really like how it came out. Maybe with the next one I can do what Kim did and put a neat little pocket inside! Oh, and the little gray bag in the first pic was a leftover from Max's birthday party. I was out of time, energy, and green fabric, so I recycled a previous craft project. I hope she doesn't mind! 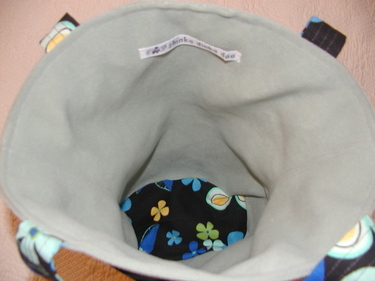 Here's a peek at the backtack II bag that I made. I don't want to show the whole thing until my partner gets it. I got a comment from my backtack partner (the one sending to me, not the one I'm sending to), and I found out that she's been in the hospital with pneumonia! Oh no! Since she didn't give me an email address to use to contact her, I'm leaving a note for her here: Feel better! Don't worry about the backtack package! I am excited to see what you've made, but I can wait. And definitely don't feel guilty. I mean it! Please take care of yourself--pneumonia is really serious. I once had a barely perceptible bit of pneumonia and couldn't walk across a room for a whole week, so I know what this is like. I finally finished my backtack bag on Wednesday, and sent it yesterday. I feel so bad about being late, but October turned out to be an even busier month than I anticipated. She should get it on Saturday or perhaps Monday (I did let her know this by email). I have pictures, but I'm posting from home on a dialup so I can't post them now. I really need to get a reasonable speed connection for home, I'm just about fed up with what feels like something slower than 9600 baud. I'm feeling a strong desire to do some knitting in November. There was so much sewing in October, I think I'm done with that for a little while. 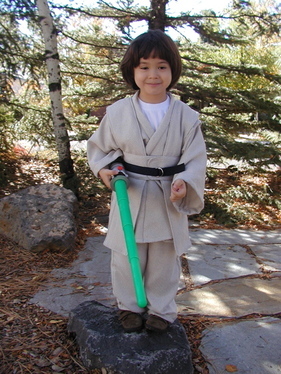 Here's Max's Halloween costume--Luke Skywalker! I finished it just before midnight on Sunday night, just under the wire! He requested it this year, after I took him with me to the fabric store and had him look through the pattern books with me. I remember doing this with my mom when I was little and having a great time. 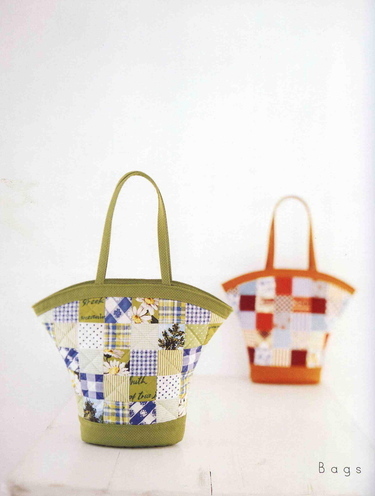 This is Simplicity pattern number 4426. I think the pattern is supposed to be Obi-wan Kenobi rather than Luke, but Max thought it was Luke so I'm not going to argue with him. Unfortunately, the pattern came in bigger kids sizes, not little kids, so I had to do some heavy modification to get a size 7 down to a size 3. It mostly worked, there was just one weirdness under the arms, but you can't see that. I used a poly blend burlap-like material because (1) it was in the clearance section and (2) it seemed appropriate for moisture farmers living on Tatooine. However, in the process of sewing this I got SO frustrated, it shreds if you look at it wrong. I don't know how moisture farmers would deal with this stuff without a serger. Max had a great time trick-or-treating this year. Every previous year he has been suspicious and hesitant at best. But this year we had his friend Jing over and they went trick-or-treating together. And partway through we hooked up with some bigger kids from down the street. So it was lots of fun. Except for the one time when Max tripped and fell on his face, scraping his upper lip, nose, eyebrow, and knee. He cried quite a bit, but was ready to go to the doorbell when we reached the next house on our way home, so it wasn't too bad.